Every month Jon ‘Mojo’ Mills and co-presenters take “The Shindig! 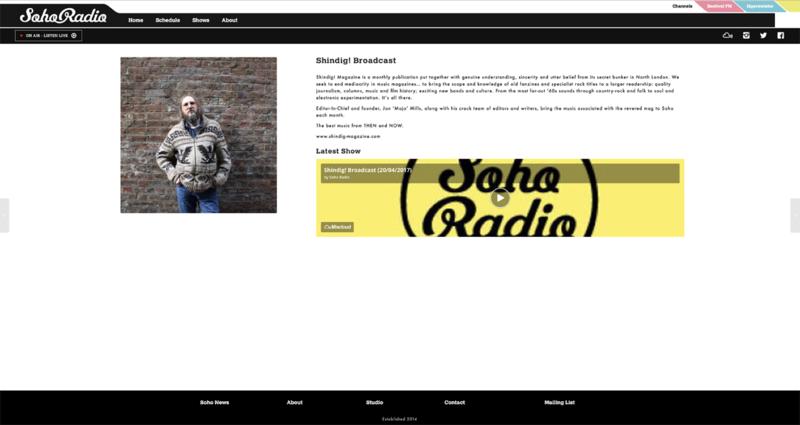 Broadcast” to the award winning Soho Radio, where music featured in each issue is played, alongside tracks integral to the presenters’ own tastes. Guests have included Fairport Convention’s Judy Dyble, author Simon Matthews, Nirvana’s Patrick Campbell-Lyons, and The Liverpool International Festival Of Psychedelia‘s Craig Pennington. Sessions have been performed by The Wicked Whispers, Emma Tricca & Jason McNiff, Cobalt Chapel and Jack Cooper. Make sure you tune in each month either via the site or later through our Mixcloud page. What is fondly known as “The Shindig! Broadcast” (the same name as the magazine’s Soho Radio show, just to confuse things) is run bi monthly at the Strongroom in Shoreditch and a quarterly collaboration with Psych-A-Rella entitled Psych-A-Rella Present The Shindig! Revue, which features DJs and live bands. The DJs have also played records for a number of events in London that have included The Chris Robinson Brotherhood at Koko, Love Revisited at The Jazz Cafe and GospelbeacH at The Moth Club. Watch social media for upcoming shows.